I would like to have my PassA75 included in the project gallery. My comments: 1/2 a Pass A75 or should I say Pass A40 Wonderful amplifier, sounds absolutely fabulous. This amp has been in operation for ~ 2 years now. This is a lower power version, biased at ~ 80 watts dissipation/channel. I adjusted the regulated output to ~ +/- 42 volts and output rails to ~ +/- 32 volts. Output devices include 4xIRFP240 and 4xIRFP9240 mosfets per channel. 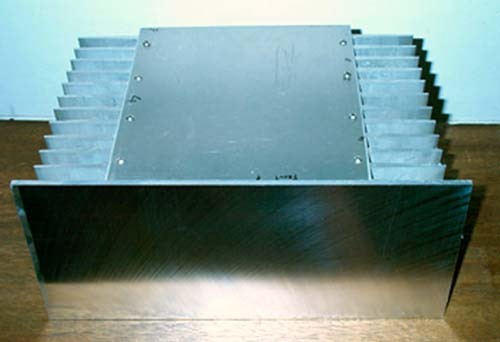 Heat sinks (same as the ones in the article!) get very warm but not hot. The design is very stable and flexible, considering my voltage rails! Mr. Pass generosity is truly appreciated. Images: Top.jpg: showing transformers, power supply board and caps. I included a 0.5 ohm resistor on one rail of the power supply for each channel. I used this to measure the 'total' bias current. After setting the bias these resistors are shorted. 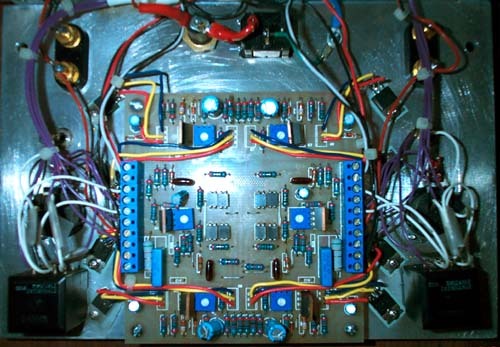 Front End.jpg: Front end mounted on the back of amp. A pair of dual 20K alps pots on the input. 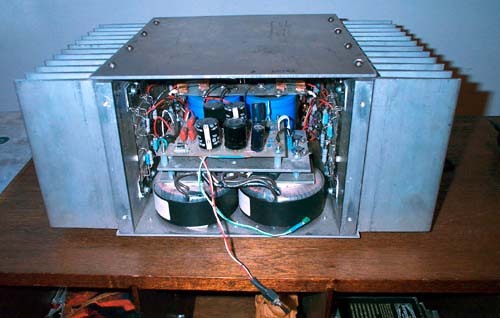 Front-Inside.jpg: The two transformers have single 24 volt primaries, wired in series to simulate a center tapped xfmr. Pass A75.jpg: Face plate not yet mounted Output mosfets.jpg: home made mounting board. Back View.jpg : boring!